Who doesn’t love donuts? That’s right; a discounted Krispy Kreme gift card will save you money on fresh donuts, coffee and more! With a menu that includes both hot and cold drinks, bagels, and a variety of oatmeal, you can’t go wrong! Stop in any time of the day for a treat you’ll surely enjoy! Founded in July of 1937, they opened their 1000th location in 2015. With delicious out of this world donuts, it’s easy to understand their success. They offer classics, juniors, holes pies, and honeybuns, all in a variety of flavors you are sure to adore; Pumpkin spice cake, glazed blueberry, chocolate, strawberry shortcake and more! Just think of the great fun you’ll have, eating those delicious donuts! And just think, with a discounted Krispy Kreme gift card, you’ll spend less money! But donuts aren’t all they have to offer! You can have ice cream, ice cream donut Sunday, and hot or cold coffee drinks, as well! How about an iced caramel latte or an iced mocha? With approximately 20 flavors to choose from, there is something for anyone. And what’s more, they have just as many flavors in hot coffees too! Purchase a Krispy Kreme gift card today and save money on donuts you’re sure to love! Just think, you can swing by on your way home and surprise the whole family- for less money! 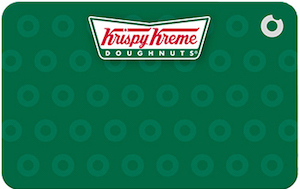 Buy a Krispy Kreme gift card from Cards2Cash, and you’ll get better value for your dollar. Use your gift card along with any other store offers and coupons to save even more money! Cards2Cash has other great discounted gift cards, so be sure to check out our listings for Duncan Donuts, Baskin Robbins, Cold Stone Ice Creamery, and more! At Cards2Cash, we help you to get the most from your money! Do you have a Krispy Kreme gift card that you aren’t going to use? Sell it to Cards2Cash, and we’ll turn that unwanted card into money! We pay the highest possible price for gift cards! If interested, visit one of our retail locations, and we’ll pay you on the spot, OR you may fill out our easy online form, and we’ll get back to you quickly with an offer for your card. Whether you want to buy a gift card or sell one, Cards2Cash has you covered!